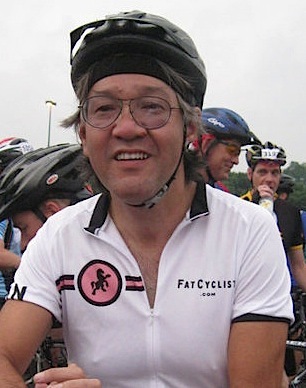 You are currently browsing the Fat Cyclist weblog archives for April, 2011. I like energy bars. There, I said it: I like energy bars. I like the way they fit conveniently in my jersey pocket. I like the way they keep me from bonking. I even like — and I know some of you will scoff, but it’s true — the way they taste. But energy bars have a huge problem. An obvious problem. A terrible problem. A huge, obvious, and terrible problem. And it must be fixed. Now. The problem is this: their wrappers. The wrapping material is incredibly difficult to tear. And if it tears, it tears in the wrong direction and may as well not have torn at all. It’s as if the energy bar manufacturers have forgotten that they’re making food that is intended to be unwrapped and eaten while gloved and riding a bike, and are instead focusing on creating contrivances designed to keep their precious food away from raccoons. 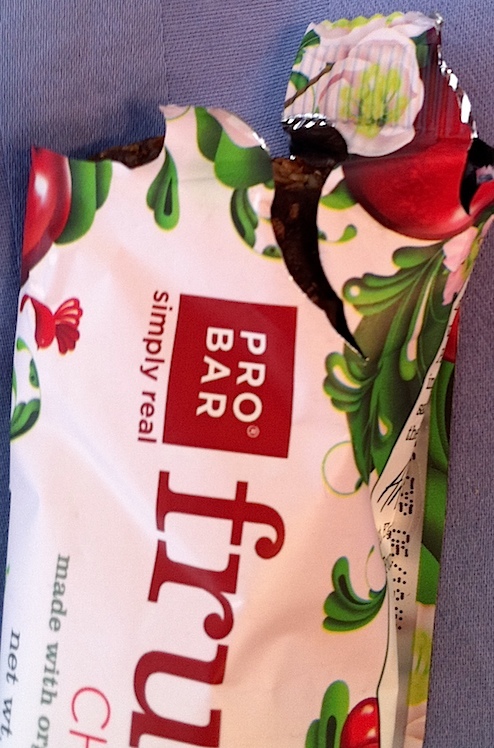 Here is a ProBar Fruition bar, a delicious (and Vegan!!!) 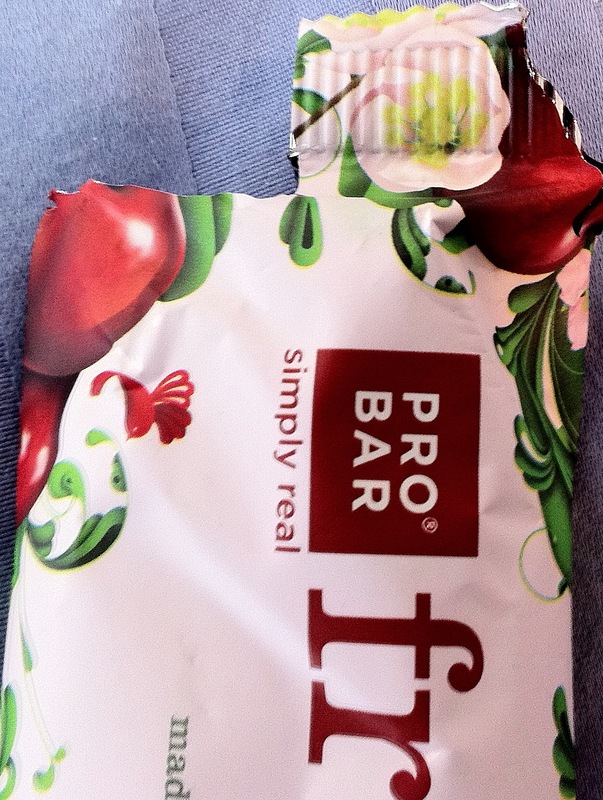 energy bar. Currently, it is my favorite on-bike food, because it’s about the right amount of food I like to eat while riding, it’s moist, and it tastes good. I like these so much that I even eat them sometimes when I’m not on the bike. But they are murder to get open. How is it possible that the tear actually went perpendicular to the angle I’m pulling it? How?! And it’s not like the tiny little pieces of wrapping I’ve just torn off with my teeth have vanished, either. They’re flapping in the wind, hanging from my clenched teeth. Which means I have to somehow discard the tiny little piece of paper. Sure, I could spit it out, but that’s littering. Or I could swallow it, but then I’d probably get excruciating cuts all down my throat as the foil made its way down my gullet (and really, that would just be the beginning of my problems). Grab the little piece of paper and stuff it in a jersey pocket. Try the whole “ripping with teeth” process again. Try using my tongue to enlarge the little hole I created. Weep pathetically, due to overwhelming hunger pangs. Try to squeeze the food through the small hole I’ve created. Ride no-handed and see if I have any better luck opening the package with two gloved hands than I did with a gloved hand and my teeth. Meanwhile, though, I’ve completely dropped away from the group I’m riding with, and have probably also veered toward oncoming traffic. Wrapper has a tensile strength less than Tyvek or steel belted radial tires. Wrapper does not require scissors, boxcutters, or high-powered industrial lasers to begin a tear. Once the wrapper begins to tear, it continues to tear in the direction at least roughly similar to the direction of force from which the tear came. In other words, the tear should not capriciously turn and run in some direction cunningly calculated to prevent food from escaping from the package. If the package has a “Tear here” indicator, it shall be printed sufficiently large that one does not need a jeweler’s loop to find it, seeing as how I often forget to bring my jeweler’s loop on rides. 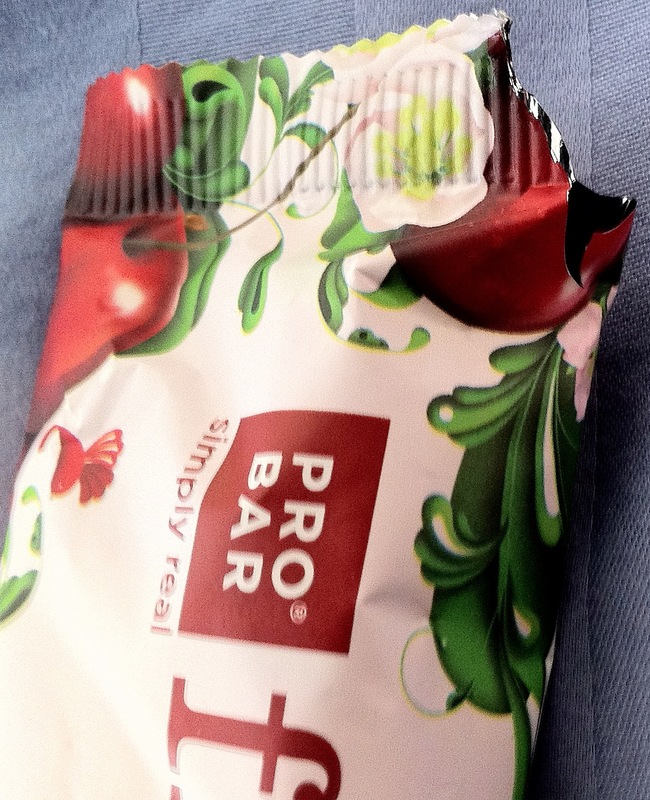 If the package has a “Tear here” indicator, one should be able to reasonably be able to assume that tearing there will produce a desirable effect (Note: Having a teeny-tiny corner of packaging coming off in your teeth does NOT count as a desirable effect). Honestly, I just want to get to my food. Without falling down. And without having to try over and over and over. And over. Is that so much to ask? I’m begging here. P2: This package requires sustained effort and multiple attempts to open, but if you practice and are hungry enough, you’ll eventually get this open. Safe for experienced riders to open while riding in a group. Mountain bikers should only attempt opening this if they are on a two-mile stretch of non-technical trail. P3: This package will resist your efforts to open it as if it were guarding the contents of the package with its life. Do nor attempt to open when riding with other people, because you will almost certainly cause an accident. P4: Attempts to open will likely result in severe paper cuts. Attempting to open while riding a bike — regardless of bike type or terrain — is severely dangerous and is not recommended under any circumstances. This package is, in short, just trying to be mean. 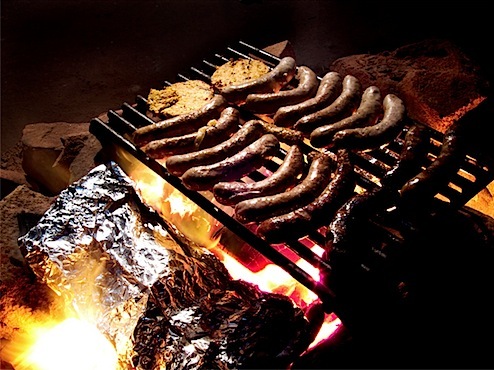 If you ask me, this is what the UCI should be focusing on right now. A “Hey, Come Watch a Movie With Me, Ask Me a Question, and Get Awesome Free Stuff” Note from Fatty: This Thursday, as part of the Utah Bike Summit, I’ll be at the Jordan Commons Megaplex for a 7:00pm viewing of Race Across the Sky: 2010 Leadville Trail 100. I’m going to be participating in a Q&A session following the movie, and will be bringing awesome schwag from Twin Six, PRO Bar, and Citizen Pictures (the makers of the movie) to hand out. If you’re even remotely local, buy tickets and come on out. The 15 seconds during which I’m in the film are truly inspiring. Ha. RAWROD (Ride Around White Rim in One Day) is — as far as I’m concerned — the official start of Spring. I’ve done this ride more times than I can count. Really, I have. I don’t have any idea how many times I’ve ridden this 100-mile mountain bike loop near Moab, Utah. I’ve written about riding RAWROD with friends. I’ve written about nearly being the victim of catastrophic biological functions while riding it. I’ve gone to court because of throwing rocks off a cliff at RAWROD. I’ve made a pretty-darned-long video of the RAWROD experience. But this year, I did it more easily than I ever have before. In fact, there were times when it felt pretty close to effortless. Which came as a bit of a surprise, because a lot of other people talked about how bad the weather — rain and wind — was and how deep the sand was for much of the course. Then most folks got to their night of little sleep and lots of listening to the wind crush their tents. The Runner and I drove out to our hotel. So yeah, I’m soft. But I slept great and got a shower the night before the ride, not to mention use of a toilet the morning of the ride (which is very very important to me, for reasons I don’t think I need to go into). When we got to the start of the ride on Saturday morning at 7:00, the signs weren’t promising. It was cold. The sky was dark, and looked like rain. But I bravely got on my bike and began the ride, The Runner at my side, her son The IT Guy staying with us. We rode for an hour, trying our very hardest to ignore the fact that the weather was getting progressively worse. Specifically, it started to rain. And then it began to rain harder. And then it began to snow. And I admit — I can admit things like this because I am a confident person and am unafraid of what others might think of me — there was a moment when I considered bailing out on the ride and calling it a day. The Runner and The IT Guy were considering similar options. As you will see, however, we not only finished the ride, but we did it all together, in grand style, and — this may sound like boasting, but I swear I’m just being honest — feeling totally fresh and strong. By the time we got back to the campsite, it had been nearly 35 miles and 2.5 hours since we had started the ride. Then we (The Runner, The IT Guy, and I) had a change of heart. We changed into dry clothes and — while Kanyon Kris made the sensible decision to head on home — started the ride over, right from the beginning. It was a bold move, but we agreed: we had what it takes — although just barely — to start over and do the entire loop. Heck, if we really pushed ourselves, we might even catch the group, now at least two hours ahead. The Runner, The IT Guy (who, for convenience’s sake, I shall hereafter refer to as “Blake”) and I took off, settling into a formation that would not change for the entire day: Blake in front setting a blistering pace, The Runner and I riding side-by-side a short distance behind. Staring intently ahead, keeping pace with Blake, The Runner agreed. As we rode in our tight bunch, I couldn’t help but notice — I wasn’t at all winded. Sure, the rough terrain jostled me around — there’s no avoiding that — but I was breathing easily. I rarely needed a drink, and the food in my jersey remained untouched. Yes, I was aware that it was a long ride and that if I went too hard for too long I could run out of gas, but that seemed a far-off prospect. The three of us had endless power, and we weren’t afraid to show it off. It continued to rain, but now it didn’t matter. I didn’t feel it, and I swear I wasn’t getting wet. Even as we flew past Musselman Arch and across the floor of the White Rim, I thought to myself, “This may be the first time I’ve done this ride where I’ve had the energy to look around,” and it was astounding. “I need to spend more time with my head up instead of looking at my front wheel for hours on end,” I noted to myself. In fact, I believe I’m going to make that my primary goal for riding this year: enjoy myself and look around. That said, we continued at a ridiculously fast pace. As we reached White Crack (don’t even bother making a joke about the name of the place, they’ve all been done), we caught the main group of riders — a remarkable achievement, I think you’ll agree, considering it wasn’t even time for lunch. That would come at Vertigo Void. “Come on over to the edge,” I said. Then — as I always do, I crawled the final several feet to the edge, laid on my stomach and looked down. Blake followed suit. “Oh, now I get it,” Blake said. Because from that position you can see that you are on an overhang that goes back further than you might care to consider. And the drop is 400 feet straight down. The weather had cleared up some; everyone agreed it was now really quite a nice day for biking. New clouds were gathering, however, and we knew that it would rain again soon. So we gathered our stuff and began the second half of the ride, still feeling good and strong. I don’t mean to boast. Really, I don’t. But The Runner, Blake, and I did things on this ride that I would never have believed possible. All three of us cleaned Murphy’s Hogback and just kept going. Then all three of us cleaned Hardscrabble Hill, where we waited for Kenny to catch up. Yes, that’s right. We waited for Kenny to catch up. And to Blake’s credit, he did not back off. He continued to push the pace. We hit miles and miles of deep sand, but while others got off their bikes and walked, we kept riding. And then, finally, we hit the big, final climb of the day. Horsethief. And while I’d like to go on dramatically about how difficult it was to climb, it just wasn’t. The three of us rode up to the top as effortlessly as we had ridden the whole day: Blake in front, The Runner and I slightly behind. We finished. Strong, and as one of the first groups of people. Plus, we had gone 135 miles, instead of the 100 everyone else had ridden that day. Pretty darned impressive, if you ask me. PS: I should probably mention that after biking the first 35 miles — 17.5 miles out, and then another 17.5 miles back to the campsite — we got off our bikes and rode the remaining 100 miles in a truck, as the Sag Wagon for everyone else. A minor point, right? This morning, Team Fatty-Philly Co-Captain Jen Yuan (Philly Jen) emailed me, saying one of the most-loved members of Team Fatty — Ryan Suenega — has passed away while hiking a treacherous trail in Hawaii. I knew him only a little bit from Philly, and since then through Facebook, but his kindness, generosity, good humor and his gentle spirit are all reflected in the remembrances on his FB page. Team Fatty lost a good one. A friend of Ryan’s has posted a blog entry with a little bit more about what happened, and what a remarkable person he was. For myself, I appreciate that Ryan spent his life having fun and helping others. And he died in context of the way he lived. I can’t help but admire that. Team Fatty’s thoughts and prayers are with Ryan’s family and friends. We’re going to miss him. A Note from Fatty: Today’s guest post comes from Tim Joe Comstock. It’s an awesome story, beautifully told. I live in a trailer park in Florida. Not a nice retirement-villa-on-wheels trailer park where the elderly neighbors swap recipes and check in on each other and play shuffleboard in the fading twilight of a rosy pink sunset kind of trailer park. The trailer park I live in is a really crappy side-of-the-highway trailer park where the dentally challenged neighbors swap drugs and have fist-fights in the shimmering glow of the pale moonlight and the occasional blue strobe lights of a police cruiser perks up the evening’s entertainment. Not that I see much of this action, not really, because while the evening’s misadventures go on outside my window I am safe inside staring at a computer screen bearing images of sweet and shiny new bicycles that I can’t afford. And reading cycling blogs by people who live seemingly charmed lives of high-paying office jobs that leave them plenty of energy and money to spend their off time riding around wearing expensive clothing that I also can’t afford while they ride the above-mentioned out-of-reach bicycles. But while I may sound bitter or disillusioned, I am not. Because I ride a bicycle too. The same roads my “superior” colleagues pedal on are open to me, also. And listen, man, I ride them. After thirty years of hard labor in the construction industry, after two marriages and houses and kids and lawyers, topped off with this never-ending “recession” and all the loss that results from loss: I ride my bike. A lot. One day a few months ago at a convenience store I was admiring a pair of touring bikes parked outside. A Raleigh Sojourn and a Trek 520. A mild-mannered fellow in full kit, a guy about my own graying age, came out and I complimented him on his bike. We were discussing the worth of disc brakes vs. cantilevers when his wife joined us, glancing nervously at my baggy shorts, sleeveless t-shirt, scruffy beard and long, bandana-bound hair. And the beer in my hand. “Well, honey, he knows all about bikes, and he seems perfectly all right…” All of this while I sat there, bemused (to say the least) and a flood of emotions went coursing through my already fairly beat down soul. But one of my saving graces at this point in my misspent old age is I don’t get offended nearly as much as I did when I was still an upright citizen. But I got off the bike. To her credit, she caught what she had done and tried to lighten the moment by giving me a strained smile and saying, “Well, you’re either a really smart homeless person or…” and then she realized that there was no happy ending to that sentence either and so I just laughed and said “Have fun on your ride, guys,” and went back into the store for another beer. Today, several months later, I was into mile 30 on my Saturday ride, just cruising along on my 1981 Schwinn LeTour, loving the day and day-dreaming on the empty country road that I like to use for my day-dreaming ride when a guy comes out of nowhere and passes me. I say “Hey!” like I always do, but he just goes on by on his carbon Cervelo. I’m sitting here in my crappy trailer park by the highway, watching the sunset, sipping a beer and gazing fondly at my old Schwinn leaning against the wall. I’m savoring the the moment when the guy finally caught up with me back in town, where I was waiting at a red light. A Note from Fatty About How You Can Be The First Person in The World to Own the Ibis Mojo SL-R: Some bikes are just a little too beautiful for me to even try to describe. I just see them and am gripped, instantly, by bike lust. 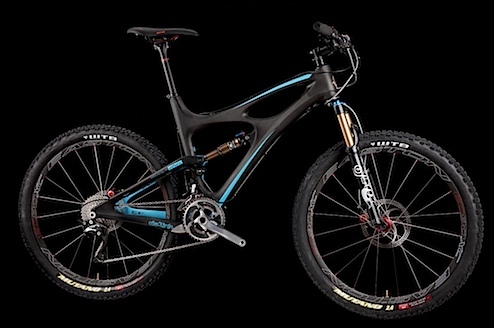 It’s the latest step in the evolution of the Ibis Mojo: a stiff, light trail bike. Pretty much good for everything you’d want a mountain bike for. Would you like to have this bike? Of course you would. Would you like to be the first person to have this bike? Darn straight you would. And you might be, if you help my BFoFF (Best Friend of Fatty Forever) Chuck Ibis as he raises money for the Sierra Buttes Trail Stewardship. Basically, you just donate multiples of $5 to the stewardship today (because today’s the last day of the contest), and then Chuck will draw a random winner from the $5 tickets purchased. You’ll be doing something good for something you care about — building an awesome trail network — and you may just wind up with bragging rights for one of the sweetest-looking MTBs I’ve ever seen. So go donate now. Unfortunately, just thinking about that drop-in can scare me off a trainer. In my year and a half of racing, I’ve never even finished with a pack. And due to a recent knee-cracking accident on the road, my quads are about as thick as my neck. If you’re falling behind, here’s a summary. My moment is super non-macho. It’s a rite of passage tale. And because I’m feeling edgy, we’re gonna Tarantino this one. And that was my proudest moment. So let’s back it up about two hours. Cue that funny, DJ scratching vinyl, old school VHS rewind sound. I race/raced for the University of Arizona the last couple years. (Go Cats!) This particular story comes from my very first race, The Squash Blossom Classic in New Mexico, in the Fall of 2009. I was racing Collegiate C’s with another first-timer and good friend. We were prepared to go hard for 19 miles of perfect New Mexico singletrack with a couple hundred other people. By “prepared,” I mean we remembered to bring water and a bike. We had no clue what we were getting into. I tried to eat and drink during the race, but it’s harder than it sounds. Maybe if I had some meat-ergy snacks, things would’ve been different. Anyway, the last 7 miles were rough. There were a couple minor wrecks that left me with nothing but gritty bottles and frustration. I was so dehydrated I stopped sweating. Bad news. As I’d find out later, the rider behind me was a lady in the 40+ category. And she was obviously faster, since she had started 15 minutes behind me. I like to think I’m pretty bright, so by this point I had realized I wouldn’t be toting home any hardware. I was racing for pride at this point. The race had become a duel. Just her and me. That last 2k I busted my rear end. I quickly realized what I thought was 100 percent was more like a B+. I’ve never been in more pain or had more fun on my bike. I could hear her behind me the whole way. Spectators were yelling for both of us, wanting to see a sprint finish. As I came over the top of a quick rise with only 50 meters to the line, I glanced back and saw her about 25 meters behind me. I did my best Cav for another second or two, then coasted across the line. Victory! You woulda swore I had just crested Alpe D’Huez in front of Eddie, Greg, Lance, Andy and Alberto. Even though I had finished 10th out of 11 in my category, I had the taste of victory in my mouth. Or was that blood? I rolled about ten yards past the finish line, clipped out my right foot and promptly fell to the left. Right in front of everyone. If my proudest moment was the perfect storm, then this was one hell of a calm. I laid there, catching my breath, reveling in rest. I cleaned up, chugged twelve gallons of Gatorade, and took a painful trip to the Porto-john. Before the race, I was nervous. I didn’t feel like a member of the club. These people were racers. They knew something I didn’t. But after that random guy helped me up and congratulated me, I was instantly comfortable. These were my kind of people. I belonged. And I finally knew what makes us cyclists. We’ll shave our legs, upgrade to carbon, shiver through arctic morning rides and frighten people with tan lines, just to destroy ourselves and end up with our face in the dirt. Because once our legs stop shaking long enough to get up, we have an indescribable feeling of accomplishment and millions of friends to share it with. My Bio: I’m a senior at the University of Arizona, studying Economics. I’ve been a serious cyclist for a couple years, but am currently sidelined with a broken kneecap. I originally hail from Grand Junction, Colorado, where the dirt is tacky and the track single. I’ll graduate in May, but have absolutely no idea what I’m doing or where I’m going. So if any of you readers are hiring, I’d love to hear from ya… Thanks for reading.